*You can get direct train from both Narita Airport and Haneda Airport. *At this Family-run, Small & Cozy hostel, you can make new friends and happy memory. 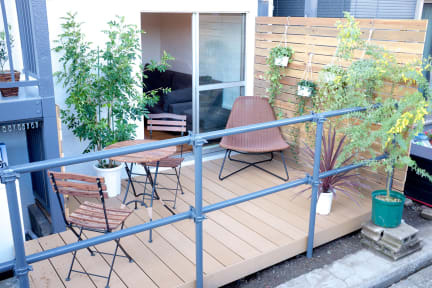 Located in Tokyo, 2.1 km from Tokyo Skytree Station, Hostel Chapter Two Tokyo features air-conditioned rooms with free WiFi throughout the property. A shared kitchen and living room are available and you can use a refrigerator, microwave, laundry machine, and so on. Kabukiza Theater is 5.1 km, National Theater is 5.8 km from the property. What a wonderful stay. My only regret is not being able to stay longer. I had one night in Tokyo and opted to stay here in a private room. The owners Hiro and Erika were so hospitable and provided many wonderful recommendations. The hostel is nestled by the Sumida, so close to the Tokyo SkyTree and is just footsteps away to the Senso-ji. The hostel is quaint, but has everything you need. It’s just a warm and friendly place. I would definitely stay here again! The place is clean. The ambience is superb. It is conveniently located nearby the main subway lines to the Metro Tokyo and from Haneda and Narita airport terminals. I will definitely book this again for the next trip. Hiro and Erika were very friendly and hospitable. They were very considerate in letting us leave our luggages at their hostel even until 10pm after checkout. The place is awesome! It’s beside the river which is a refreshing view waking up. A few meters away is a metro station and Asakusa shopping street and temple. Very convenient! One of the best situated hostel/hotel i have ever been to. Perfect for first timers to Tokyo. So close to major subways. Can get directly to and from Haneda and Narita without changing trains. Close to major tourist venues. Right on the river! Amazing views from balconies and roof. Very unique! I forgot art in the lobby I bought. I realized on the way to the airport. I emailed them waiting for my flight. They responded Immediately offered to mail it for a reasonable fee. Thank you Hiro!!!!! Great experience, place was immaculately clean, bathrooms and showers were very modern, hosts were very friendly, accommodating, and fluent in English. One of the best in tokyo! Stay here and you wont regret it! It was a great place to start my vacation in Tokyo. I was able to walk to some cool tourist attractions and it was so close to the subway (which also comes straight from Narita Airport). The bathrooms were clean and really nice. It was nice to have a place to lock a few things and a place to hang my coat inside of my bed area. Have already recommended to friends and would stay here again. Hostel Chapter Two was one of the most comfortable places I have stayed in my travels. Three friends and I shared a private room that had everything we needed. The facilities were amazing, and the rooftop view is incredible! The host, Hiro, was one of the nicest people I met in Japan. He was super helpful in giving some advice about the city. Above all else, he is a Mariner's fan!! The location is really good as you can access the two main airports and main attractions such as asakusa temple, market and skytree. Staff are really polite and friendly. Rooms are very clean and facilities are great. Very spacious pod, small locker so luggage fits in your pod/next to your bed. Wonderful staff! Easy access to the metro line ( if staying and visiting multiple areas I’d advise a suica/passmo card). Safe and near popular area for sightseeing. Easy to find (look for hostel vending machine)-2 toliets/showers per floor but no issues arose. Could use a thicker mattress but ok for 4nights.Hard to meet people as a solo traveler, there were no social events and everyone has their pod curtains closed.